A flexible dungeon-themed pixel art platformer tileset! 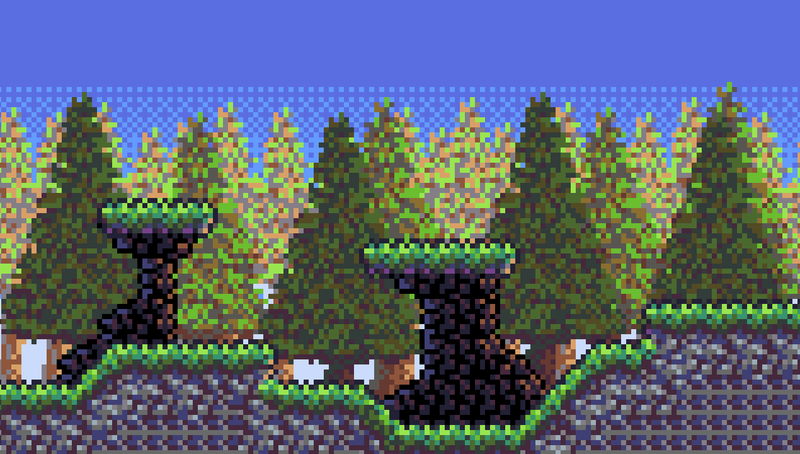 Build a grass level for your platformer with this retro tileset! Ready to devour your soul! Over 100 high quality pixel art objects, items, and animated collectibles! A flexible sci-fi pixel art platformer tileset! A collection of 25 pixel art tilesets! A free crusher enemy for your platformer game! 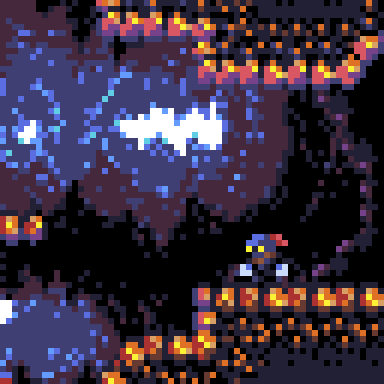 Build a cave level for your platformer with this retro tileset! A comprehensive pixel art RPG cave tileset! A free, flexible pixel art grasslands tileset! A comprehensive pixel art RPG dungeon tileset. 40 incredible 60-FPS pixel art explosion effects! A generic, but flexible pixel art tileset! The perfect enemy for any platformer game! A Mega Man style tileset for your pixel art side-scroller! Desert platformer tileset with four color themes! Twenty incredible 60-FPS pixel particle FX! Twenty incredible 60-FPS particle FX! The spooky Skeleton Warrior & Archer are here, and they mean business! Build a level for your platformer with this SNES-inspired tileset! Build a cave level for your platformer with this SNES-inspired tileset! 70 retro sounds, including environment sounds, using items, fire igniting, falling, crashing, and more! 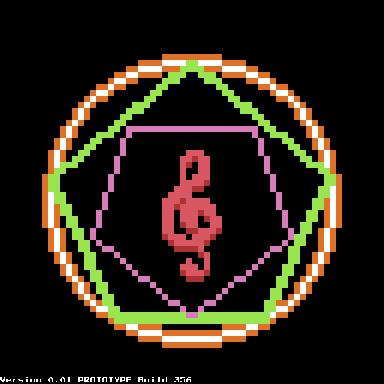 70 retro sounds, including coins, explosions, powerups, and more! Need the perfect jump sound effect? Gotcha covered! The Valiant Knight is ready to save the day! With many fluid high-quality animations, he can be the hero of your game! Assets can be used in both for-profit and not-for-profit games provided I am credited somewhere in the product. That's a really cool idea! I'll put it on my to-do list. It might be a little bit before I get to it, so hang tight. Valiant Knight was updated recently with more animations, so be sure to re-download it if you haven't already! Hi there! All frames are 72x63. The previews are upscaled for display purposes, and you can feel free to upscale them in your game as well. Let me know if I can answer any more questions! Agreed! I've been planning to do a balance update for a while now (and also add 2 more levels), but work has unfortunately been keeping me super busy. I think since the level 1 boss is the most complete, it's also the hardest at the moment. Both commercial and noncommercial use within those terms are permitted, and modifying it is fine too. Let me know if I can answer anything else! Right now it just has a run animation. I'll add a walk animation to my to-do list! I used my own program, which is still in development. Hoping to have it released soon! It's possible, yes! It might be a little while before I get around to it as I have other projects going on, but it's something I've been thinking about for sure. Thanks, glad you like it! For the next update I'll consider additional animations like rolling. In that case, the log file should be in your Home folder. You can find it by opening Finder and pressing Command-Shift-H. Without the log, I can only guess what the problem is... The game has had very limited testing on Mac, but it does work for my tester. I'll let you know when the next version is out! Are you using Windows? If so, using your Windows file browser go to This PC -> Local Disk (C:) -> Users. In that folder you should see a folder named after your Windows username. Inside it should be a file named demonshymn2_log.txt. If you're able to find it, please attach it to an email and send it to bugs@untiedgames.com. Otherwise thanks for the bug report- Even if I'm not exactly sure what the problem is, I'll try and add some backup method of drawing in the next version. Thank you! That narrows it down a little. The gameplay section uses a different method of drawing than the title section. Would it be possible to send me the log file for the game? It should be in your user folder, like C:/Users/YourName/demonshymn2_log.txt. If possible, please send it to bugs@untiedgames.com. Hmm... That's no good. Did it display the title screen / intro animation at all, or only the credits? Looks really fantastic! Excellent pixel art as always! I know about this bug! Sorry you encountered it on the final boss. After the game jam rating period I will be updating the game with bug fixes as well as additional content! The skulls are supposed to not appear within a certain radius of the player, but it's possible for the player to move into that radius while they're appearing. I might be able to tweak this. You can indeed dash and jump at the same time! Start a dash on the ground, and then press jump to do a jump that'll give you more distance. You can get over spike pits with a normal jump if you jump late enough, but dash-jumping is where it's really at. Thank you for playing and I'm glad you enjoyed the artwork! A dash jump gives you more distance, but the same height as a normal jump. To get on the platforms in that room you have to wall jump on the edge of the platform. Thanks for the feedback! I agree, the backgrounds probably had too much going on for this game. That's something I'd like to work on. Glad you enjoyed it, and thanks for playing! I'll be updating it with more levels at some point. But I did figure out I can just run your game with the command "java -jar game.exe"! So I was able to play. I got to level 3 and my high score is 30. Cool little game concept! Thanks for the feedback! I agree, I think the forest level in particular has a little too much going on in the background. Holy crap. Lots of new stuff! TONS of new music added by my good friend and amazing musician, Charlie McCarron! To say it's "epic" is an understatement... You'll have to wait 'til release to hear it! Added a skippable intro cutscene before the title drops. Level 1 is 100% done! There's also a new HP meter, which you can see here. Max HP has changed from 3 to 5. All player and enemy graphics have been updated to contrast better with the backgrounds. A shader now keeps all the colors locked to the DB32 palette. Blue Slimes have arrived! They're just like Green Slimes, but don't do anything special when they die. Wolves have returned from Demon's Hymn 1! They're basically the same, but now their eyes turn red when they're about to jump. Level 1 changes from bright and sunny to dark and rainy midway through the stage. The rain collides with the terrain and it's a really cool effect! Here's a GIF of an earlier version of the game that shows off the rain. Another enemy has arrived in level 1, but I'm not going to spoil it! The level 1 boss has arrived, but I'm not going to spoil it! There's a little cutscene before the fight. That's all for now! It's going to be a challenge to finish on time, but I'm prepared to do whatever it takes. Half of level 2 is done. Level 3 will repurpose level 1's tileset, and level 4's tileset is almost done. In the event that I don't finish on time for the jam, I still intend to finish the game! Sure, feel free to give credit wherever you like. I don't have any robots or dinosaur assets yet... Maybe in the future! Hi, glad you are enjoying the artwork! Thank you very much for the support, I really appreciate it. Let me know if you have any questions about the assets! Hi again! I've made a lot of progress since last time. Fixed camera bug. Should be a lot smoother! Added new enemy: Slime. It has 4 HP, which means the player can kill it in one combo attack. Be careful though... It does have an attack, and when it dies you might want to step back! Added new enemy: Stinger. It has 1 HP, but is pretty fast and can attack from above. Maybe the player will get some kind of move to deal with these in the future...? Expanded the cave level. I'd say it's about half done right now. And it's definitely a hard level! In the final game, this will probably be level 2. You might notice holes in the terrain. I do only what the player can collide with first, and that way I can change it easily if I have to. 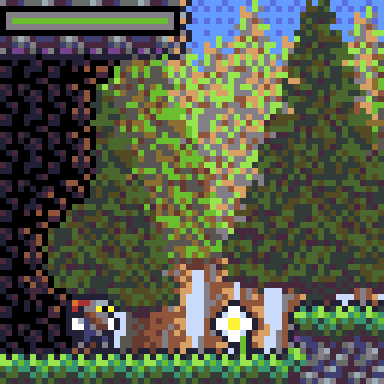 Finished quick and dirty tileset for the forest level. 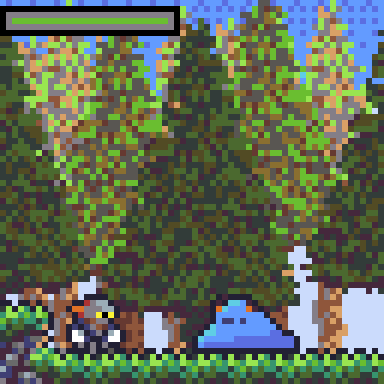 The terrain filling in this mockup image is a little messy because it's using the Retro Pixel Cave tileset layout. In the final game, this environment will appear in the first level! That's all for now... See you next time! Like I said in the opening post, I knew I had a convention coming up that would cut into my dev time. Day 2 was taken up by getting Atmocopter ready to demo at 2D Con: Lots of bugs were fixed, and I added a whole new intro cutscene! I think I do some of my best work before conventions... It didn't crash once! Days 3 and 4 were convention + sleeping. I woke up super early on day 3 and worked on Atmocopter like crazy before the convention. Day 4 was much of the same. The convention was a lot of fun! On day 5 (yesterday) I had a little more free time, and I put together the beginnings of a level in Demon's Hymn 2. It features parallax scrolling backgrounds, something I wasn't able to do in Demon's Hymn 1. Getting them to not look too jittery is a challenge at the 64x64 resolution. They also didn't want to play nice, and kept scaling the pixels slightly wrong, so I'm using a new rendering system where I render everything to a 64x64 buffer and then scale it up when I draw to the screen. There are a few camera issues. You can see when I climb up the wall, the camera jerks around a bit. This was a bug from Demon's Hymn 1, and also a bug currently in Atmocopter, as they use the same engine and camera system. 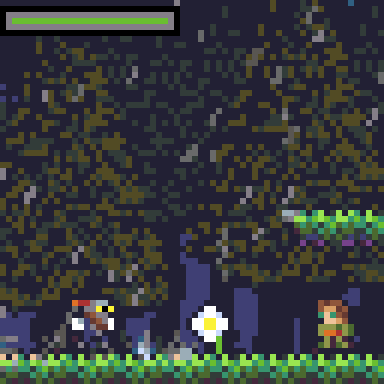 I'm gonna see if I can finally fix that today, and maybe add a few enemies! Now that I'm all done with 2D Con, I can finally get to work on this for real. Looks very nice so far! Can't wait to see how the gameplay will work. Hi everyone! 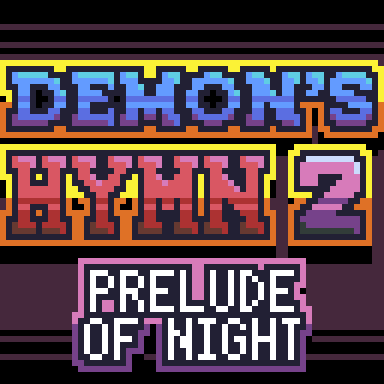 I'm Will from unTied Games, and I'm happy to announce that this year I'll be making a sequel to Demon's Hymn, which earned 5th place in LOWREZJAM 2017. This year I'm hoping to do what I couldn't do last year with the game: More levels, more environments, more enemies, and more moves! It's going to be a fun challenge, and also a bit of a time crunch. I'll be exhibiting my main project, Atmocopter, at 2D Con from August 3-5, so that'll cut into my development time a bit. 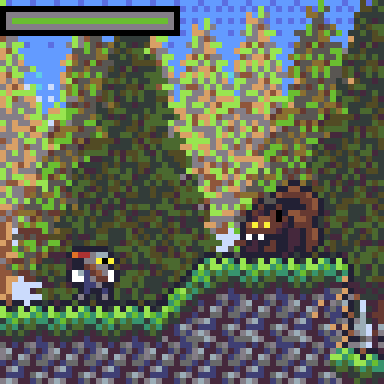 Between that, my regular pixel art work, and real life, we'll see if I make the game happen in time! Check back often for updates... I love to write 'em! I'm a bit rushed to fix bugs in Atmocopter before the convention, but I started work on Demon's Hymn 2 today. I got the project set up and running, and made some palette updates to the main character. 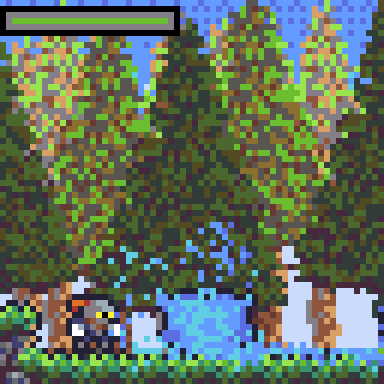 Because I'm planning a few different environments for this game, I decided I'd use the Dawnbringer 32 palette to try and give all the game's art a cohesive look. 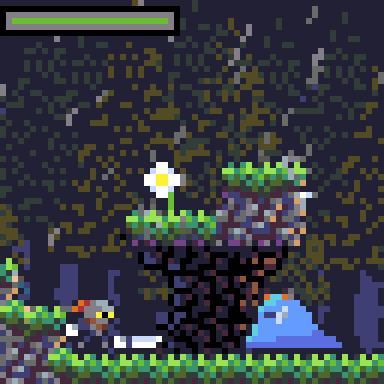 Here's a mockup of how a level in Demon's Hymn 2 might look, using the DB32 palette. I'll be leveraging some of the art assets I've already made to speed up development and make the game the best I can. The tileset pictured is Retro Pixel Cave. I was a little concerned about whether or not the character would stand out enough from the background, but I think it'll be alright in motion. Aw, what the heck. Let's just animate it quick and find out! Should be fine. He might get lost a little in the bluer areas of the background, but the motion should be enough to make it clearly visible where you are on the screen. Finally, here's the title screen. Thank you, glad you enjoy the art! Thank you! I definitely like some of my work more than others, but this one turned out really nice I think. All my assets can be used in any game, whether it's for-profit or not! Thanks for reminding me- Just added them! They're included as PNG sequences. Thanks! I haven't used Tiled before, but I will install it and look into it. Redistributing as part of a commercial game is 100% OK! I've made the full license text available here if you'd like to read it. Wow, I didn't know you were so prolific! Awesome! From one pixel artist to another- These are incredible! Really fantastic, high-quality work. Keep it up! I'd be down to include separate versions without glow if people are interested. Here's what the effect in the original post would look like without glow. To me it has a lot less "wow" factor compared to the original, but maybe I could tweak it somehow to fix that.